As a part of Hon’ble Prime Minister Mr Narendra Modi\'s Digital India and Atal Innovation Mission, students of Jhunjhunu Academy - Aman Khan, Nitu Agarwal and Lakshya Choudhary under the mentorship of Mr. Akash Modi, Director & Mr. M K Tyagi, PGT Physics attended the Atal Innovation Challange at New Delhi last November. These students presented a very ingenious idea to purify water right during its transportation, thereby saving a huge amount of time and money on its purification at the point of consumption. Their presentation and idea was judged as one of the best in the nation and hence, Niti Aayog, an independent authority setup by Central Government of India has selected Jhunjhunu Academy to set up \"Atal Tinkering Lab\" in its campus. This lab is aimed at fostering curiosity, creativity and imagination in young minds and inculcate skills such as design, computational thinking, adaptive learning etc. Dr Ravi Shankar Sharma, Principal proudly mentioned that Jhunjhunu Academy Wisdom City got selected to set up this lab by passing through a three level challenge of Innovation in Science and Technology. As many as 13,000 CBSE schools presented their projects at Federation of Indian Chambers of Commerce and Industry, New Delhi. A grant – in – aid of Rs. 20 Lakh will be provided to the school for the establishment of this lab. In the coming months with the assistance from Niti Aayog, New Delhi, an ultra-modern Atal Tinkering lab will be set up in school premises. It will open access to educational \'do it yourself\' kits and equipments on - science, electronics, robotics, open source microcontroller boards, sensors and 3D printers and computer circuitry to students of Jhunjhunu Academy. It was indeed a great day for Jhunjhunu Academy family, when Jhunjhunu Academy was awarded by the prestigious Best Private School in Rajasthan Award. The award was conferred by Merit Awards and Research Media Pvt. Ltd. under the India’s Most Prominent Education Awards 2017. Giving recognition to the continuous state board merits, best board results, all round development of students of Jhunjhunu Academy school the organization invited Jhunjhunu Academy and Dr Modi for this high ranking prestigious award. On behalf of Jhunjhunu Academy, Dr Dilip Modi, Chairman and the Founder of Jhunjhunu Academy received this prestigious award in a blissful ceremony held at Shangri-La’s – Eros Hotel, New Delhi on 18th March, 2017. International fame Indian author Mr Chetan Bhagat conferred the award to Dr Modi and extended his good wishes to Jhunjhunu Academy family. The organizers and the convener of the award ceremony congratulated Dr Modi and said that his service to the field of Education is exceptional and the journey of 35 years in K-12 education is a niche in the field of education. Delighted with the award Dr Modi extended many thanks to the students, parental fraternity and staff members of Jhunjhunu Academy and dedicate this award to them. Once again, Jhunjhunu Academy proved its mark with 23 selections in Military School Examinations through its Sainik/Military/Navodaya Coaching classes of Jhunjhunu Academy. Coaching Head, Mr Ram Swaroop Jhajharia reported that these 23 brilliant gem stones gave yet another glorious chance to celebrate. Jatin Yadav, Deepanshu Yadav, Mohit Khanna, Sahil Rathore, Anees Kumar, Navdeep Kumar, Saahil Yadav, Praveen Choudhary, Chirag, Himanshu, Sourav, Naveen Kumar, Avraj Singh, Sparsh, Ansh Kumar, Aryan Manjot Singh, Yogesh, Gaurav, Kunal, Abhishek, Himanshu Choudhary and Nitish Kumar proved their caliber and make their parents and teachers feel proud. Where on one side JIVEM Chairman Dr. Dilip Modi, Managing Director Mrs. Nirja Modi, Executive Director Mr. Ashutosh Modi, I & P Director Mr. Akash Modi, Principal Dr Ravi Shankar Sharma, H.M. Ms Saroj Singh and Hostel Superintendent Mr. Kurda Ram Dhinwa congratulated the students and teachers of the Sainik/Military Coaching classes and gave the sole credit to them for their dedication and hard work, on the other side selected students and their parents thanked and gave credit to the well designed and planned courseware of coaching, 24 x 7 vigilant management team, the preparatory OMR Sheet Test Pattern and the teachers who were present wherever and whenever required. It is re-iterated that 43 students got selected in Sainik School Examination this year. School adds a very innovative and new feature in \'Navrang Kala Mandapam\' by launching \'Karaoke Music Club\'. Dr Dilip Modi accompained with Mr Ashutosh Modi, Executive Director, Mrs Ranu Modi and Akash Modi lit the lamp to inaugurate the Music Club with a hope to deliver world class musical enviornment to all music lover students. A high class Karaoke Music Software is loaded in Navrang Kala Mandapam which will facilitate the students with live instrumental music alongwith the lyrics display on the big screen. \"We are excited to offer this new facility to our students which allows them to deliver an exciting new experience of music learning\". Stated Dr Modi while expressing his views on this launch. Dr Ravi S Sharma, Mr Shyam Sunder Sharma, Mr Kurda Ram Dhinwa, Ms Saroj Singh were also present there. Facilities of the club were explained by music teacher Ramzan Rizvi & Ashok Tanwar with the Incharge Mr Virendra Singh. 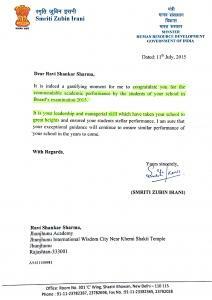 Jhunjhunu Academy received a Personal Appreciation Letter from HRD Minister consecutively Second Year in a row. HRD Minister personally congratulated the Principal Dr Ravi S Sharma and his team for producing outstanding CBSE board results in session 2014-15 by giving a remarkable no. of 90% Students in Commerce, Science and FMM and 10 CGPA students. In a personal appreciation letter received from Hon’ble HRD Minister Ms Smriti ubin Irani, Jhunjhunu Academy got a very positive reception of the outstanding board results of class 10th and 12th. Madame Irani congratulated the whole team of Jhunjhunu Academy on the stellar performance of the students of Jhunjhunu Academy in CBSE Examinations. She appreciated the endeavors being done by the Management of school and expressed her wish to work with Jhunjhunu Academy to ensure the culture of excellence and innovation that school is working in. In return, Dr Dilip Modi, Chairman, MD Mrs Nirja Modi, Executive Director Mr Ashutosh Modi, Dir. Infra & Planning Mr Akash Modi, Principal Dr Ravi Shankar Sharma and Mrs Saroj Singh, H.M. thanked Madame Irani and assured her to always work for the brilliance in all important field of Education and repeat their pledge to play their role in nation building like ever. It is reiterated that Jhunjhunu Academy has given 22 students with 10 CGPA and 26 students of class XII scored more than 90% marks in their examinations. 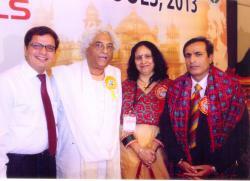 Dr Ravi Shankar Sharma, Principal at wisdom City and Vice-Chairman at Shekhawati Sahodaya returned from Amritsar after participating in 20th National Annual Sahodaya Conference, held at Amritsar Sahodaya Complex, Amritsar from October 8th , 2013 to October 10th, 2013. Around 1000 CBSE schools from the various regions of the country participated in the 20th National Sahodaya Conference. The conference was organized by Amritsar Sahodaya. The theme of this conference was designed by the Central Board of Education (CBSE) . The theme of the conference was 'Future ready schools — leading the future of learning'. Mr. Rajeev Sethi Chairman of the Asian Heritage Foundation (New Delhi), Sadhana Parashar, Director of academics, research, training and innovation at the CBSE, Vineet Joshi, CBSE chairman, and Dharamveer Singh, president of Amritsar Sahodaya inaugurated the conference in Hotel Radisson Blu, Amritsar. The major objective of the conference was to let teachers as well as principals recognize the need for enabling constructive and fruitful use of technology installed in schools. E-learning technologies, innovations, empowering teachers through technology, training global learners and educating leaders and vocationalisation of education were some of the main sessions during the conference. During the conference Jhunjhunu Academy was appreciated for its adoption and implementation of latest technologies in the education. Dr Sharma also had a fruitful chat with Mr Vineet Joshi, Mr Rajeev Sethi and Mrs Sadhana Parasher. He discussed the latest teaching pedagogies. Dr Sharma was warmly welcomed on his return. In felicitation ceremony he shared his experience with the students and staff members and promised to use his experience in the best interest of the students and society. Once again, Jhunjhunu Academy proved its mark with 10 selections in Sainik School Examinations through its Sainik/Military/Navodaya Coaching classes. Coaching Head, Mr Ram Swaroop Jhajharia and Headmistress Ms Saroj Singh jointly reported that these 10 brilliant gem stones gave yet another glorious chance to celebrate. Mr Jhajharia proudly stated that the exam was held for different states in which Rahul Kumar, Himanshu, Abhishek, Pankaj Kumar and Kuldeep Singh got selected for Sainik School, Chittorgarh, Rajasthan whereas Akash Tomar, Abhishek Singh and Atul Kumar got selected for Sainik School, Kunjpura, Karnal (Haryana). In the same line of glory Chirag got selected for Sainik School, Rewari (Haryana) and S. Deepak got selected for Sainik School, Amrawati Nagar, Tamilnadu. Principal Dr Ravi Shankar Sharma congratulated all the selected students and repeat his promise to put every hard effort in view of making a niche in the field of Sainik/Military/Navodaya preparation coaching. These gleaming stars were also congratulated by Dr Dilip Modi, Mrs Nirja Modi, Mr Ashutosh Modi and Mr Akash Modi. A warm felicitation ceremony was organized to reward the success of these students. Jhunjhunu Academy added another golden feather in to its bejeweled cap when thirteen of its learned scholars scored more than 90% of marks in class 12th CBSE result 2014. Kumari Divya Kaswan topped the list of the school in Science stream by scoring unbeaten 94.60% of marks while Ankita Tulsyan topped the list in Commerce stream by scoring 94.20%. In Science stream Siddha Sharma 94.40%, Ankit Punia 92.40%, Jitendra Singh Raghav 90.40% and Nishant Bagaria 90.00% registered their names in the glory of Jhunjhunu Academy. In the same line, Rishabh Agarwal 93.40%, Shivani Agarwal 92.60%, Noopur Katewa 92.40%, Gaurav Kumar Agarwal 92.20%, Khushboo Makharia 91.20% registered their name in the toppers list of Commerce Stream. Besides this, 28 students of school scored more than 85% and 53 students scored more than 80% of marks. 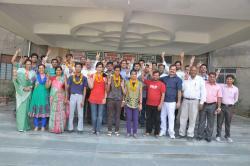 Dr Ravi Shankar Sharma, Principal stated that this is yet another finest result in the Shekhawati region. He iterated that in Music Ankit Khichar scored 99 marks, in Maths Pratibha Gurjar scored 98 marks, in Chemistry Divya and Ankit scored 97 Marks, in Painting Ritika Bari scored 97, in Physical Education Shrawan scored 97, in Business Studies Noopur Katewa scored 96, in Physics Nikhil and Siddha Sharma scored 95, in Biology Rahul and Divya socred 95, in English Siddha, Prachi, Pradeep scored 95, in Accountancy Priya, Vicky, Shivani, Khushboo, Rishabh, Ankita and Noopur socred 95, in Economics Shivani, Khushboo, Rishabh, Gaurav, Ankita and Noopur scored 95, in MWT Nikhil Kaler scored 93, in Hindi Anupriya scored 88, in IFM-II Kumari Jyoti scored 85 and in BPO Skills Pradeep scored 84 marks. Dr Dilip Modi, Chairman JIVEM, Managing Director Mrs Nirja Modi, Mr Ashutosh Modi and Mr Akash Modi have expressed joy and congratulated the students on their success. It was their perseverance and faith in their teachers that led them to such brilliant success. 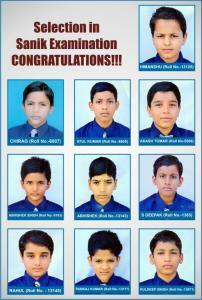 The achievers have attributed their success to the valuable guidance and blessings of their parents and teachers. Hon'ble Chairman at JIVEM Education Dr Dilip Modi awarded with a prestigious Business Rankers Award 2014 on July 19, at Hotel Clarks Amer, Jaipur. The award was conferred on Dr Modi by an International Magazine on Industry, Corporates, Inclusive Growth and CSR Practices. He was rewarded with the titles of Best Visionary Leader and Most Innovative Business Person in the award ceremony. Former MP Mr Ramdas Ji Agarwal, Mr K L Jain, Mr Goyal from Rajasthan Chamber of Commerce were also present in the award ceremony. The award was conferred on Dr Modi on his dedication and devotion towards the herculean efforts that he made in all the important fields of K-12 Education from 31 Years. Delighted with award Dr Modi said that "I receive this award on behalf of my whole JIVEM Family including students, parents and staff members. A delegation of 14 students of Jhunjhunu Academy left for Mumbai on 20th September, 2010 to participate in Youth Leadership Summit 2010 and 2nd National Conference on Tobacco or Health. The delegation is being led by Santosh Kotiyal, HOD English. The students would interact with their counterparts from different parts of the country as well as from abroad. Mr Kotiyal said that on 21 and 22 Sept. the students would be taking part in different constructive and learning oriented activities as a part of Youth Leadership Summit, from 23 to 25 September they would be participating in 2nd National Conference on Tobacco or Health. The delegates will discuss among themselves the ways to make the world tobacco free place. Principal stated that “it is a matter of immense pride that the students of Jhunjhunu Academy have been selected to participate in YLS for the third time in a row.” The group was given a warm farewell in the school. The students and the staff wished the delegates a brilliant success.